Coelurus was another late Jurassic dinosaur period that lived between 160 and 150 million years ago. This dinosaur lived in North America. Coelurus was a small theropod dinosaur, it was just about 2.4-meter long, 0.7-meter height and weighed about 13 to 25 kg in weight. Coelurus was found for the first time in 1881 by David Baldwin, then Edward D. Cope named it as Coelurus in 1889. Coelurus means ‘hollow form’, because of its hollow bones. Coelurus was a small carnivore. This dinosaur eat smaller mammals , insects and lizard as its prey. Because of its small size, Coelurus was probably a quite fast animal. As its evidence, we can saw it from the structure of the bones in its feet. This dinosaur also included as bipedal dinosaur that can walked using two-legs or four. 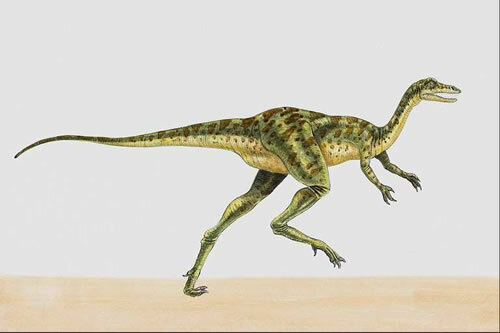 Coelurus had a short skull and taller than Ornitholestes. Slender vertebra with a very long neck. This dinosaur had strong pneumatic long bones with hollow vertebrae and hollow tail. Studies reveal that Coelurus lived in the woods. Coelurus was one of the most mysterious dinosaur and very interesting dinosaur. It wasn’t as big as another carnivore dinosaur, it was a fast dinosaur when predator will face a speed-problem to hunt.